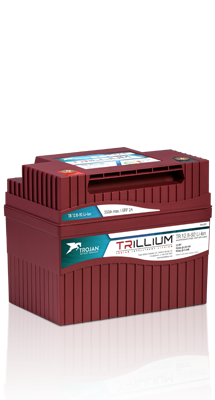 Trillium lithium ion batteries feature a Trojan-specific cell, which undergoes a 128-point quality control check and is 100 percent X-ray inspected to ensure the highest quality. It’s cobalt-free and nickel-free, and it features the industry’s safest chemistry. Most importantly, Trillium features extraordinary life—greater than 5,000 cycles— and this power is packed into a battery footprint that’s 20 percent smaller than competitive offerings. Trillium has automotive-grade components for durability, safety, and a current sensor, fuse, and temperature sensor. It’s waterproof and dust proof, with an IP67 environmental rating—the highest in its class by far. 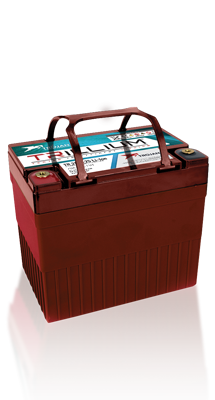 Trillium is designed to be a true replacement for lead-acid batteries and can be used with existing lead-acid chargers with AGM/GEL settings (I-E profile). Trillium gives you more runtime and a longer life than competitors’ batteries in its class and delivers consistent power across the state of charge range. It can be charged in less than two hours. It features a simple system that is scalable up to 48 volt applications.